Thanks for the samples of OIKOS SuperGrains Greek yogurt! This yogurt tastes like sweet yogurt, the texture is thick as greek yogurt should be and the addition of “super grains” makes the yogurt grainy. I’m used to consuming plain kefir and plain yogurt so I found the fruit on the bottom of the container too sweet and the OIKOS yogurt left my mouth a coat of dryness, possibly it was the preservatives such as cornstarch or locust bean gum. I personally wouldn’t buy this yogurt, I prefer if the “super grains” retained a crunchy texture as I like the contrast of soft, smooth yogurt with something for my teeth to crunch through. On the plus side, this product is fairly healthy from a nutritional standpoint. Each serving of OKIOS SuperGrains provides 90 calories and 8g protein which I would recommend to people looking for a healthy snack choice or who want to eat a healthy breakfast. However the addition of super grains can be misleading as it may make people believe they’re eating a healthier yogurt. 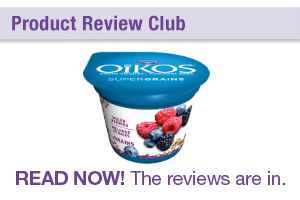 The super grains adds only an extra 1g of fibre compared to the other OIKOS yogurts, which is not a significant increase. If people are looking to add extra fibre or nutrition to this yogurt, I’d suggest adding fresh fruit. 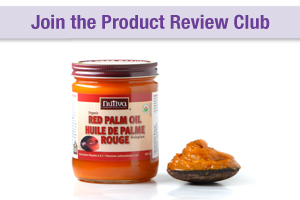 Overall, this product was pretty good from a healthy eating perspective, I give it 4/5 stars! Thanks for letting me sample the SodaStream play machine. I made sparkling water flavoured with peaches. After carbonating the water, I added canned peaches including its syrup for a light, fruity drink. The water machine was surprisingly easy to make, I wasn't sure at first if I had carbonated it properly because it seemed almost too easy. If I was hosting a food party, I would use it again. This makes for a fun conversation starter and could be used to swoon your dinner guests. However, I wouldn't buy a machine to use just for myself since I don't drink sparkling water often. I would recommend this to people who are looking for ways to increase their water intake, though I'd keep in mind its cost (including the carbon filter and the flavour pods/sweeteners), how often they drink sparkling water, if they have time and the motivation to use the machine on a regular basis. From a dietitian standpoint, this is a good way to improve someone's fluid intake if they enjoy sparkling water. Although I'd also indicate that there are several other ways to reach that goal as well. Thanks for letting me try Nutiva's Organic Chia Seeds! I used these chia seeds in my morning smoothies, sprinkled on top of my peanut butter toast, and mixed into my yogurt. I love the delicate crunch and neutral taste. I look forward to using them quickbreads or savoury dishes to add extra nutritional value. Chia seeds are a great way to add omega-3's, fibre and protein to my diet and they don't need to be ground up like flaxseeds which makes them even more versatile. I've never heard of Omega Crunch before so I was looking forward to trying this product. I enjoyed trying the different flavours, they were all quite mild in flavour so I ended up sprinkling more than I thought I needed. I used the sweet maple and sweet cinnamon in my morning smoothies and cold cereals, the roasted garlic and regular in my stir-fried noodles and rice. I like that they are easy to use and very versatile. I’d definitely use these again though the price is pretty steep given there are plenty of other sources of omega-3 fatty acids and plain flaxseed (both whole and ground can be bought in bulk). These are certainly convenient as they are already shelled and come in easy to use shakers. I’d recommend these as an alternative to regular flaxseed for people looking for a simple and convenient way to add omega-3 and fibre to their diet. I used hemp hearts in my morning smoothie and added them to my yogurt. I enjoy the delicate nutty and creamy flavour. I like that every serving (3 tablespoons) provides 10g protein and 3g of fibre, although it's high in fat at 10g, they are still considered healthy fats. They make a good alternative to nuts and other seeds. I'd use them again for sure and I'm curious as to how hemp powder would taste as an alternative to whey protein. Thanks for letting me sample these yummy hemp seeds! Thanks for letting me taste test these! When I opened the bag, I was surprised. These freeze-dried pears didn't look like what I had expected, they look like pieces of Styrofoam. Unlike dried pears that retain a yellowish color and are easy to identify as having been a fruit in its past life, these didn't look very appetizing. They are mildly sweet and seem to melt in my mouth. I was disappointed because pears have such a nice floral flavour to them, these freeze-dried versions seem to dumb that down. I definitely prefer dried pears. Although these are a healthy snack and can be fun to try, I wouldn't buy these or recommend them. They're quite expensive, $1.75 for a small bag whereas you can get a pound of fresh pears about $1.59. One fresh pear will give you a lot more fibre and vitamins than a serving of freeze-dried pears.